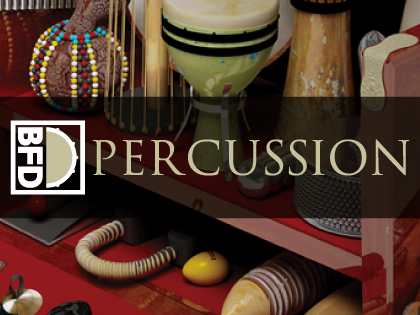 BFD Percussion adds an extensive suite of detailed percussion instruments to your BFD3, BFD Eco or BFD2 installation. Its sounds cover latin, world and kit-centric percussion as well as outlandishly strange junk percussion and kitchenware. 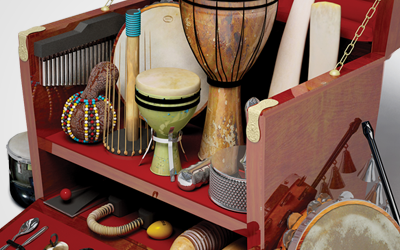 Included are congas, bongos, timbales, djembes, darbukas, udu, ashiko, bodhran, chimes, triangles, shakers and tambourines alongside esoteric effect sounds like thundersheets, waterphones and bowed gongs. The grotesquely beautiful junk percussion range includes trashcans, saw blades, saucepans and other intriguing household objects. In fact, BFD Percussion literally contains the kitchen sink - in full multi-sampled, multi-articulated form! BFD Percussion is produced in a similar setting to BFD Jazz & Funk Collection and the Mapleworks kits in BFD3. With a tight and focused room sound and a high-end recording chain, BFD Percussion perfectly captures the lush ambience and expressive depth of these eclectic instruments and is perfect for use in all styles of music. The collection also comes with a bonus set of percussion Groove performances. "In its richness of sound and expressive capability BFD Percussion is head and shoulders above any percussion or drum module (hardware or software) I have heard."